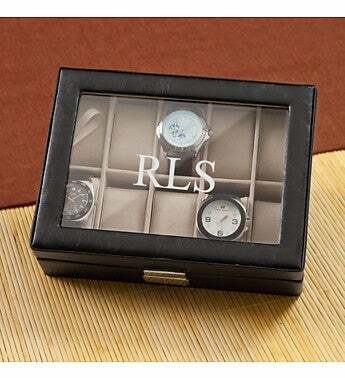 Measures 9 3/4" x 7 1/4" x 2 3/4"
This black top-stitched leather watch case has a glass hinged lid and is a great way to showcase and protect his watches. Ten khaki suede-like removable velvet watch cushions providing plenty of room for his valuables. Case clasp closure in polished-nickel locks for extra protection.